"This is an outrage. 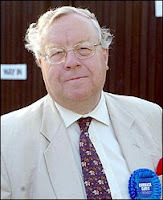 If there's no room for people like Sir Patrick in the modern Conservative Party, then Middle England really should be worried"
There is more information at the blog of Oliver Kamm: Tory ructions. He will now have to win the support of the local party in a secret ballot. He has indicated that if he loses, he will stand as an independent candidate. Martin Bell has indicated that he will support him in this eventuality. Why do I care? He has consistently voted pro-life over the years and I wonder whether his deselection has anything to do with this in the new climate of "modern conservatism." Here is a link to his voting record on various matters of interest.